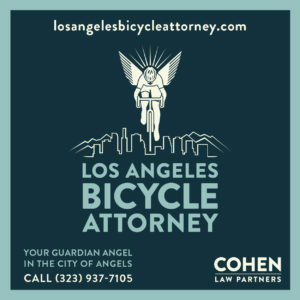 According to LAPD statistics presented at yesterday’s bike liaison meeting, bike-involved collisions are down dramatically throughout Los Angeles compared to this time last year. No stats were available from West Traffic. No reason was given for the sudden improvement in bike safety; as one officer said, it might just be luck. But it’s a good way to start the year. Meanwhile, things aren’t looking as good in the Inland Empire. Hit-and-run collisions involving pedestrians are up 73% in San Bernardino County and 51% in Riverside County over the last five years, while hit-and-runs involving cyclists are up 34% and 40%, respectively. An Anaheim bike rider was critically injured in a collision while crossing South Beach Blvd Thursday evening. Let’s all hope he’s okay. I’m normally not a big fan of the visibility arms race, in which it seems like every rider has to outdo everyone else to capture the attention of drivers. But this new backpack seems like a great idea. 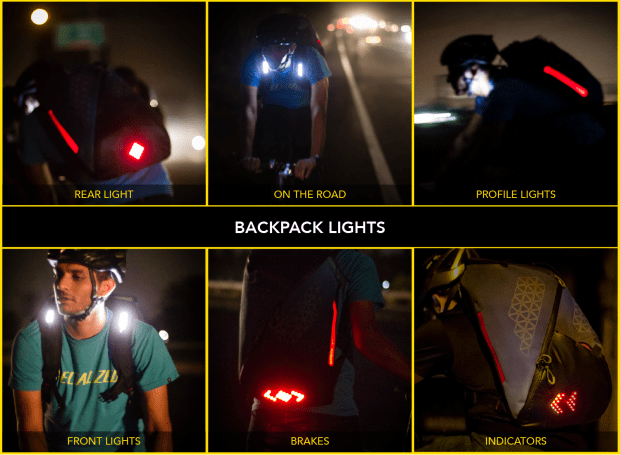 The Bluetooth-enabled Aster backpack from India’s Lumos Design Technology, currently raising funds on Indiegogo, lights up the night with side and rear LED lights, as well as forward white lights on the front straps. Not to mention turn indicators and automatic brake lights. It also functions as a commuter backpack, unfolding completely to provide easy access to your stuff, while offering helmet and U-lock holders, and a detachable shoe compartment. And it was designed for use in the US, and product tested right here in California, with feedback from 50 or so riders from the Bay Area. 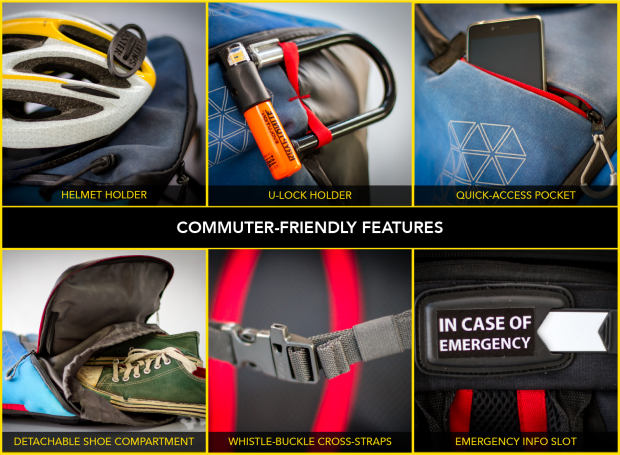 As a special offer for BikinginLA readers, the first person to pledge at least $75 on the Aster Indiegogo page will also get their Lumos Thrillseeker Solar Daypack, designed to convert sunlight into electricity to charge your USB devices while you ride. 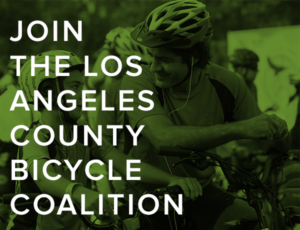 Just include “BikinginLA” in the comments when you make your pledge. But remember, this offer is limited to the first person to make a $75 or higher pledge; there’s no way of knowing if someone may have beaten you to it. CiclaValley recaps Wednesday’s Traffic Safety Summit in Valley Village. The LA River is slowly coming back to life in the San Fernando Valley, with plans for a walkway on one side and a bike path on the other. Monrovia police bust a hit-and-run driver who left a cyclist with minor injuries. Thanks to DreamWaveDave for the link. The lead guitarist for the band Pennywise is suing Uber after he was doored while riding in Hermosa Beach last year; the passengers stayed to help, but the driver fled. Bike-friendly Long Beach wants to extend bicycle improvements to the city’s Southeast Area. 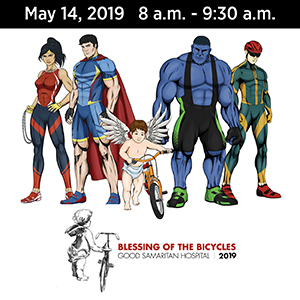 The Armenian Youth Federation’s annual Cycle Against Denial will be held in Santa Monica for the first time on April 10th; the event marking the anniversary of the Armenian Genocide had previously been held in the San Fernando Valley. San Diego horses can be trained to share trails with bicycles, unlike the ones that use Burbank’s Mariposa bridge, apparently. Maybe they have smarter horses down there. Temecula’s Sarah Hammer is the first American cyclist to qualify for the Rio Olympics; the multiple silver medal winner hopes her third Olympics will bring gold. Although she may have trouble winning anything if they don’t get the track installed in time. The OC Register suggests a two-wheeled wine tasting tour through the Santa Barbara wine country. 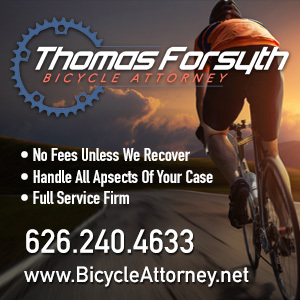 A Contra Costa county bike rider is under arrest for randomly hitting and blocking people on a local pedestrian pathway. Sunnyvale’s mayor accepts a student’s challenge to ride a bike to a local high school, and sees first hand what students have to deal with. San Francisco’s red transit lanes are forcing cyclists out of the right lane and into traffic. Fremont becomes the latest California city to adopt a Vision Zero plan, while Daly City considers it. Someone must not like mountain bikers in Folsom Lake. Three riders were forced to take cover when bullets flew over their heads, even after they called out to stop shooting. Bicycling offers advice on riding during your period. Or maybe gel for your hoo ha would help. Treehugger says the cargo bike is the new family car. The Department of DIY strikes in Portland, as someone puts up fake speed limit signs saying 20 is plenty. A Washington bike commuter suggests it’s your own damn fault if you get hit by a car if you’re wearing dark clothes and not using lights. Police in my hometown finally make an arrest in the case of the courteous hit-and-run driver who apparently moved a bike and backpack to the curb, but left his victim lying in the street. A protected bike lane in Nebraska suffers $2,500 in damages when a wrong-way driver plows into the concrete divider. On the other hand, without it, that could have been a bike rider. When a Pennsylvania man walked over to the local police station to see if they’d found his stolen bike, a bighearted cop dipped into his own pocket to buy him a new one. Thanks to Mike Bike for the heads-up from his home town. Bike Radar looks at ambitious mountain bike products that failed big time. Folding bike maker Brompton calculates it costs the equivalent of $62 a month to store a bike in your London home. Not that you have a London home, of course. And not like they have a vested interest in suggesting you might want a bike that takes up less space. A British cyclist is riding 1,400 miles across England to collect signatures for the Queen’s birthday card. A new Irish study says the perception that you’re only riding a bike because you can’t afford a car is slowing efforts to get people out of theirs. When police can’t identify the vehicle a piece of plastic came from, the Internet can. If you take your imaginary friend for a ride, does he need his own bike? And if you’re going to flee the scene after a drunken wreck, maybe it’s best not to be painted gold from head to toe. First, and most important, I hope and pray the injured man recovers quickly and completely. Second, I have mixed feelings about this crash. That’s because Beach Blvd (California Highway 39) is the busiest street in Orange County. Drivers frequently drive 50 or 55 mph, and it’s very crowded. It’s basically a freeway with a few stop lights. Despite this, I frequently see pedestrians and bicyclists crossing Beach Blvd between intersections. It’s a very dangerous game, and too often someone ends up hurt or killed. Just as Beach Blvd is full of cars, it’s also full of pedestrians and bicyclists, usually on the sidewalks. Bicycle infrastructure along the route is long overdue. Even the streets that run parallel to Beach Blvd, and might provide alternate routes, have little or no bicycle infrastructure. It’s a recipe for disaster. Unfortunately, this bad situation is made even worse when pedestrians or bicyclists take chances with their lives by crossing the road between intersections. The bigger problem is poorly designed streets, too-high speed limits and lack of enforcement. Until we get average speeds down to a max of 30 mph in urban areas, people will continue to die.